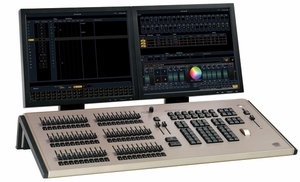 Element offers affordable control for smaller venues with single console operators or volunteer staffs. Element is designed for mainly conventional lighting rigs with some motorized accessories, LEDs and a few moving lights. Available in two physical models, Element 40 or Element 60, the consoles offer built in LTP channel and submaster faders that change mode with the turn of a switch. More complex devices are controlled using the on-screen On Demand ML Controls. To get users up and running quickly, Element provides command prompts on screen above the command line. Two DMX universes are available at the console, or all outputs may be distributed via Gateways, or ETCNet2 DMX nodes (purchased separately). Ships With: Element ships with a dust cover, power cord, mouse and mouse pad. An external keyboard is not shipped with the console. On screen keyboards are provided. Any USB keyboard may be used with Element if a physical keyboard is desired. • Supports two external DVI displays, single or multi-touch optional, 1280x1024 minimum resolution.